When you cast your line over, you want to know that you won’t sit in one spot for hours, only to find after the fact that it was empty water. With a fish finder sonar unit, you can spot the fish before you cast, so you can know you are where the action will happen. 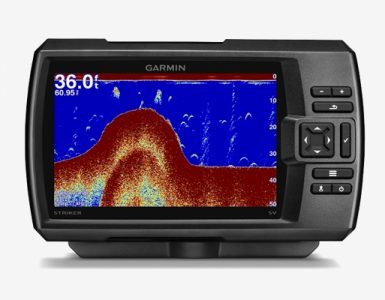 And when you lay down cash for a value sonar unit, you want the best of the best, and now that is the Garmin Striker 4. The Garmin Striker 4 isn’t an ordinary sonar unit; this baby comes equipped with the latest advances in fish finder technology. The biggest of these is the CHIRP sonar, or Compressed High Intensity Radar Pulse. What sets this apart from the rest of the crowd? The Garmin Striker 4 comes with everything you need to set up and get fishing: Power cord, a tilt and swivel mount, transom and trolling motor mounts, and a dual beam transducer (77/200 kHz). Enclosed in a sturdy plastic housing, the Striker 4 also comes with a sealed, rechargeable battery with charger and suction cup mounts for use in a smaller vessel, such as a canoe or kayak. At 8.1oz and measuring 3.6”x5.9”x1.6”, the Garmin Striker 4 truly is a big thing in a small package. The display is HVGA color, with 480×320 px resolution. The controls are keypads on the front face of the unit. The unit has a water rating of IPX7 (will withstand everything but all out swimming, with a tolerance of immersion in 1 meter for 30 minutes). Ordinary sonar functions on the broadcasting of a single frequency wave. This means it sends and receives back one frequency. This translates to limited interpretation and image production capability. The Garmin Striker 4 Portable is equipped with CHIRP (mid and high frequency ranges) sonar, operating on a 77/200 kHz scale, which sends out a burst of frequency waves, across several different kHz frequencies. This translates into much greater image clarity, as different objects react differently to different sonar frequencies. What this means is, that by sending out many different frequencies, the unit will detect objects better because it will have sent out a frequency wave that optimally transmits an image of that object. This enables you to detect target fish with much greater clarity and accuracy, which results in more fish caught than if you used a sonar unit without CHIRP technology. You can also accurately differentiate between target types. While this unit comes with 77/200 kHz CHIRP sonar built in, you can up your game even more by upgrading to a high performance CHIRP (Striker 4 comes with low to mid CHIRP) transducer, a GT8 or GT15. You can also use traditional 55/77/200 kHz sonar. This isn’t the only goodie the Garmin Striker 4 brings to your boat: This baby comes with high sensitivity GPS, so you can mark the docks and create waypoints for easy navigation back to home base, mark obstacles or hideouts along the way, note hot spots, and even check your boat speed, which is a huge benefit for trollers. 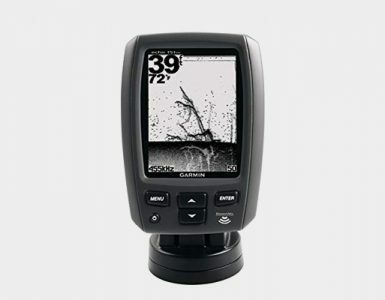 A great help to stationary fishermen, the Garmin Striker 4 is also a flasher, so you can get an image of what is directly beneath you. You will get a reading of the bottom, be able to watch you jig and bait, get a reading of the depth of any fish that swim into the beam. For any type of fishing where you are stationary, this is a truly game changing feature. 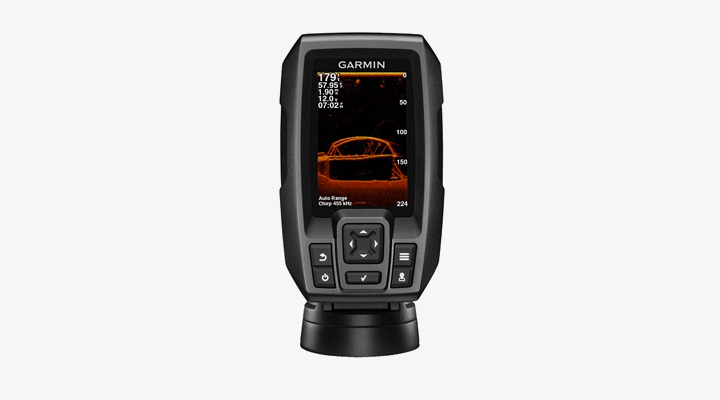 Other noteworthy features of the Garmin Striker 4 include a water temperature log and graph, a target depth meter, Fish Symbol ID, which helps you differentiate between different targets, AutoGain Technology to reduce clutter on the screen, an adjustable depth line (measure depth), A-Scope, which will give you a real-time display of targets passing into your sonar beam. Also included is a water temperature sensor. The Garmin Striker 4’s sonar has a range of 1,600 ft in freshwater and 750 ft in salt water. This can be extended with the purchase of more powerful transducers. 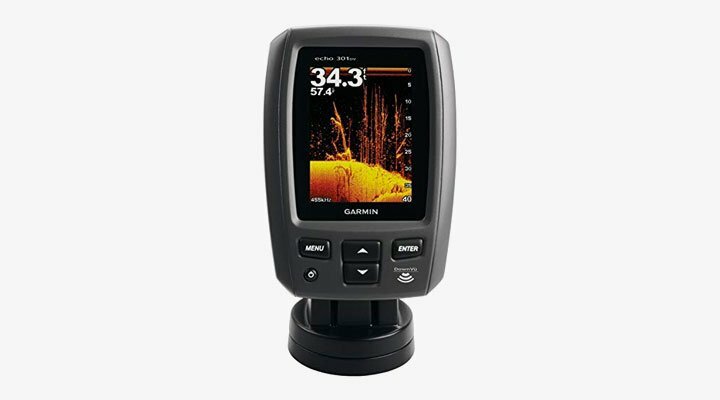 So, when you’re looking to take your angling to the next level, whether you have yet to break into the use of sonar fish finders or are just looking to upgrade, seriously consider the Garmin Striker 4. One of the best fish finder for your money. You won’t be left waiting for the fish to come to you; you’ll be going to them.